Kids, just like the busy grown-ups around them, live in a world of sensory overload. They are busier than ever, spending increasing amounts of time out of the home. Many even claim to be “bored” on stay-at-home days. They live in artificially stimulating environments – from technology-connected computer games, television or car DVD players to super-sized enrichment experiences in music, movement, art and literature. Kids as young as a year old are being wowed on a daily basis. At what point, does all the razzle-dazzle become a distraction from learning and growing? 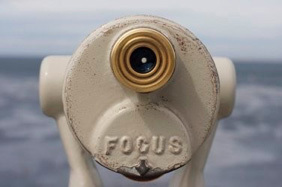 Educational researchers, like Ellen Galinsky and Elena Bodrova, have concerns about how well we’re teaching kids to “focus” which Galinsky describes as the ability to “pay attention, remember the rules and inhibit one’s initial response to achieve a larger goal”. Learning seems to be accelerating at warp speed yet it feels like the stone-ages when kids don’t get their way. Psychologists are similarly concerned about the high cognitive and social cost of multi-tasking. Patricia Greenfield and Yalda Uhis from UCLA and the Children’s Digital Media Center believe multi-tasking can “cause situational Attention Deficit Disorder which can lead to irritability, declining productivity and disorganization”. They also see decreases in family interaction time. Gary Small, the author of iBrain, believes multi-tasking kids children lose valuable interpersonal skills essential to understanding and responding to others in social situations. 1. Help your child notice where his attention goes. Your awareness teaches your child how to focus. Every time you play “I Spy” or “Simon Says”, you help your child tune-in to people, places and objects around him (and to disregard other sensory messages). 2. Help your child manage distraction. As your child focuses her attention on one thing, she must ignore competing sensory input – which is easy when mom announces it’s almost time for bed. Other times, however, it’s the parent who “holds” the focus when your child wanders mentally and physically – like when you’re reading a book, playing a game or putting away the toys. Multi-tasking parents on cell phones break the attention-connection before the child learns to manage interruptions. 3. Build attention stickiness. Children need daily practice playing independently. TV and video do not really promote independence unless the child is actively engaged singing, dancing, and interacting back. Open-ended play that matches your child natural interests – like cars, blocks, art material, pretend play, books – engage children’s imagination and problem solving for longer periods of time. Start with five or ten minute sessions and gradually add ideas or props to stretch your child’s ability to play longer tomorrow, or next month. Young children are notorious multi-taskers. They sing in the bathtub, dance while listening to their favorite story and hear your entire phone conversation while building entire block cities. So, how do you know when multi-tasking is good or bad? You must study your own child. Children learn with and through their bodies. So, it’s often a mistake to “force” children to “sit and pay attention” – that just makes them squirm more and plot their escape instead of really paying attention. However, research on adult multi-tasking suggests that retention and efficiency is compromised when you attempt two different tasks that use the same parts of the brain – like emailing while talking on the phone. So please get your child’s undivided attention before asking him a question while he’s watching his favorite video. Otherwise, you’ll miss the opportunity to teach him to listen when people are talking. Life is busy. But kids need time to grow and learn. Slow down – pat attention when you’re interacting with your child. Unplug from screen-time – plan a single-focus activity every day or a family-day once a week. Make time to listen – to the world, to each other and to the quiet. Your child will be smarter for it.